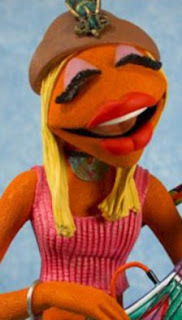 Hat tip to the Lizards at Celebritology for noticing the resemblence between Nicole Richie and Janice, the guitarist for Dr. Teeth and the Electric Mayhem. 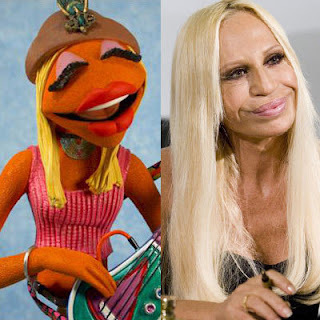 But Janice has a particularly chameleon-like quality since she also looks like Donnatello Versace. And reality TV star New York. As well as other reality show star Daisy from Rock Of Love. 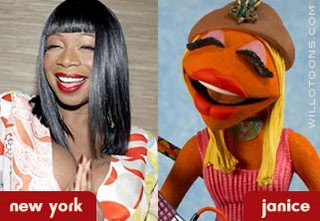 BlatantCommentWhoring™:What other celebrity does Janice or any other muppet resemble? 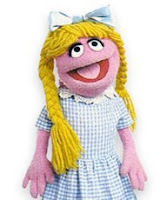 Update: Lizard hodie thinks Nicole looks more like Betty Lou from Sesame Street. This image is going break a few browsers, but I just can't justify posting it any narrower. This is the Grand Prismatic Spring in Yellowstone and is a composite panorama of five individual images. The spring is just too big to bet into one frame. It's good to travel but it's also good to be home. I've been sorting and cataloging the nearly two thousand pictures we took on vacation and it's going to take a while to separate the wheat from the chaff. And there is a lot of chaff. The biggest problem is that mere photos can't capture the sheer beauty of the West. Between sweeping vistas, exotic wildlife and majestic scenery there is just too much to absorb. I've never quite comprehended the vastness of this beautiful country of ours until the last week. Normally I have a never-explain, never-apologize policy on my extended absences from the blogosphere. But this time I have an excuse. I keep getting stuck in traffic. This year as part of our "see all the famous landmarks before the terrorists blow them up" strategy we are in the upper Great Plains furiously checking off boxes on the states we have never visited list. So far we've hit Minnesota, South Dakota, and Wyoming with Montana and South Dakota still to go. These states are HUGE. We are traveling several hundred miles a day just to get from place to place. At the end of the day rather than check e-mail or Facebook, I just collapse in bed from exhaustion. Part of that is self-imposed. As the titular head of the family, I invoke the drive-as-much-I-want privilege only relinquishing the wheel to my wife when it looks like there is a particularly nasty flash flood inducing storm in the distance. Instead I just took out my revenge at the next town by ordering a half-pound lamb-burger. There are also roadblocks by aggressive panhandlers. While this guy's buddies stubbornly stood in the middle of the road, he came up to our window looking for a handout. 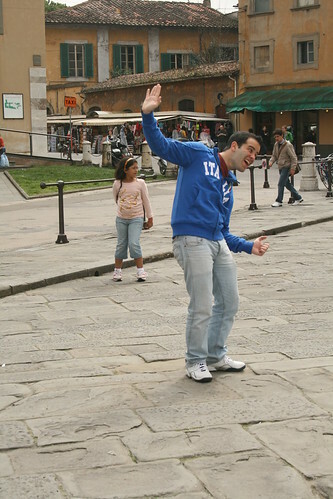 The concept of tourist trap is taken very literally. He does nothing all day except pace back and forth in front of the exit hoping for someone to give him an excuse to file a personal injury lawsuit. 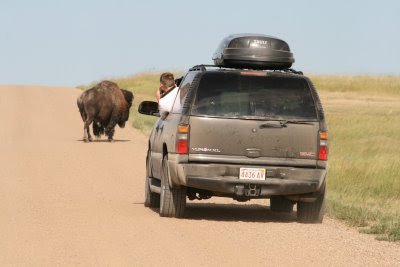 There is a song about where the buffalo roam. It doesn't tell you they tend to roam into the middle of the road. 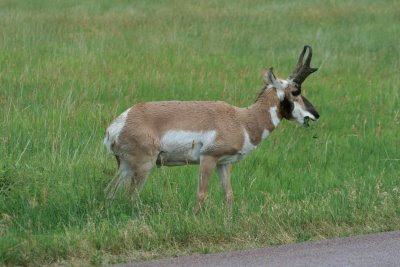 Trust me, when a few of these guys wander into the road, they ALWAYS have the right of way. That same song talks about where the deer and antelope play. But nobody tells them not to play in traffic. So when I get back from waiting for various critters to cross the road I will get back in the blogging groove. As long as I don't have any roadkill in the grooves of my tires. No, your eyes don't have double vision, the image above is a parody of my site done be the far too funny VE. One of his recurring projects is to poke fun at the blogs of his readers in descending order of comment frequency. Being fairly far down the list (not that I don't read all his posts, just some merit a snarky retort more than other) I knew this was coming but it still delighted me to see it happen. At first I didn't quite get it until I realized he changed Foma to For Ma and then used all my standard sidebar items to make me look like a mamma's boy. Well played, sir. And as nonsense it is truly fantastic. Gawker discovered this site that asks silly questions including nearly 80 about which celebrities are gay. As Gawker discovered, the general public are idiots. Case in point: If Mario Lopez is really gay, he's a far better actor than his stint on Saved By The Bell would indicate. Closet watching is a time-honored avocation here at Foma* Central but clearly a few people taking this poll are behind the curve or have let their People magazine subscription lapse. Several of the celebs on this list are either out-out or so lightly closeted that they might as well hang their clothes in Times Square. A few other results are so inexplicably off that I can only assume there is a huge wishful thinking contingent of gay folk out there stuffing the ballot box, so to speak. When people can spend months even debating Adam Lambert while Zachery Quinto gets a collective shoulder shrug in the zeitgeist, the whole concept of being closeted has been subverted. Most gay celebrities have found ways to tip-toe around their personal life without any outright deceit. In my mind, the only people that can even justify trying to cover up their orientation nowadays are Republican governors and the costars of Sandra Bullock romantic comedies. These are the only two groups whose livelihoods are threatened by an inadvertent outing. And in either case, they would kinda deserve it. Still, in the world of gossip, it's a fun game as long as there's no malice involved. But at least it's cute to see Anderson Cooper and Jodie Foster still so close together. Which proves the power of open closet plausible deniability. BlatantCommentWhoring™: What is the most surprising position on this list? 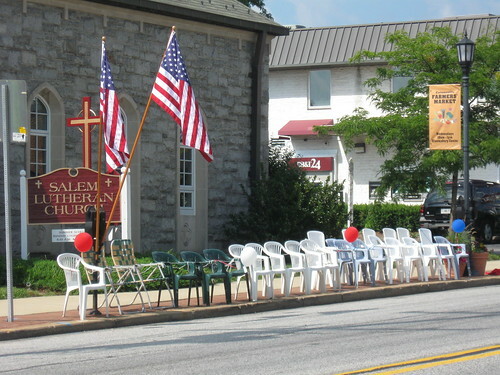 The quaint little town of Catonsville, just over the river from Ellicott City, has an old-fashioned Fourth of July parade every year. 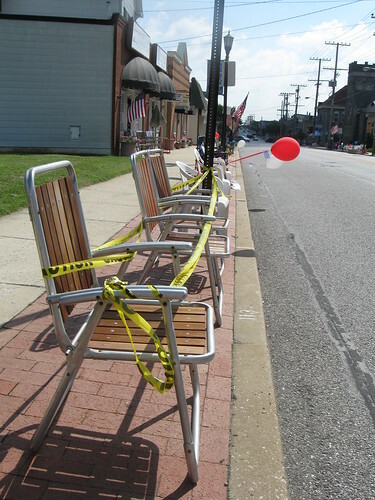 What distinguishes it from other small town parades all over the country is the lengths people go to in order to secure prime seats for the show. 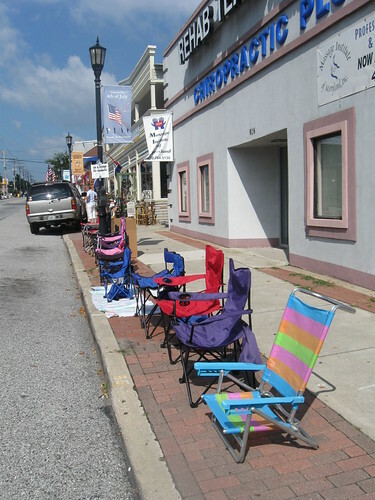 Days ahead, people start lining the street with lawn chairs and blankets and benches. They use cord or cable or rope to secure their site and will often leave their family name taped to the lawn furniture. 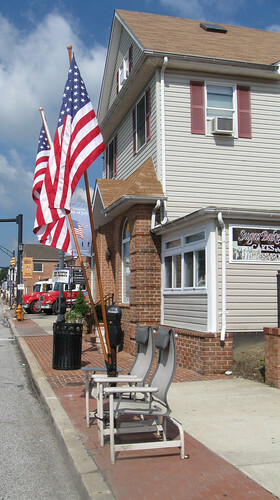 This morning I rode my bike up the trolley trail to take in this display of possessive patriotism. The parade doesn't start until 3 p.m. but all these pictures were taken between ten and eleven this morning. Folding chairs, beach chairs, camping chairs, it doesn't matter. Some groups of chairs are more organized than others. If you don't have enough chairs for the space you need to save, use police tape to reserve the extra space. These were two of the nicest chairs on the route. 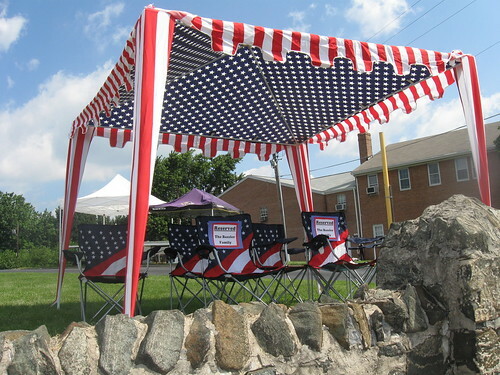 People are mighty trusting with their stuff on the Fourth. There is a brand new ice cream shop in Catonsville called You Scream. They marked off their section of the sidewalk for their customers. 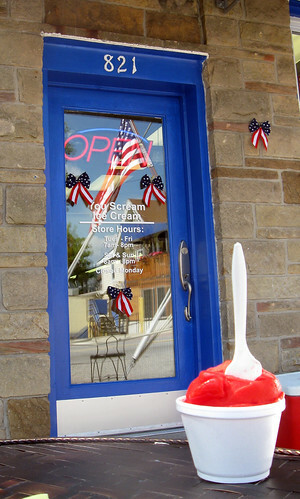 I had some delicious cherry italian ice because it looked so patriotic. 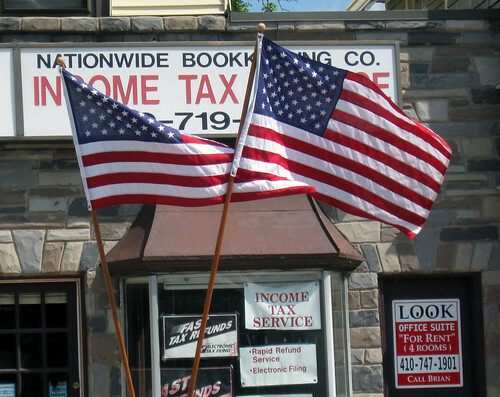 Nothing says patriotism like paying your taxes. And some people take the color scheme to the extreme. 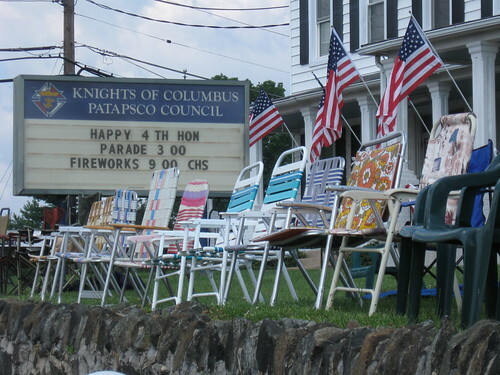 The Knight of Columbus want to wish you a happy Independence Day, hon. So whatever you do today, celebrate the freedom and spirit that makes America great. 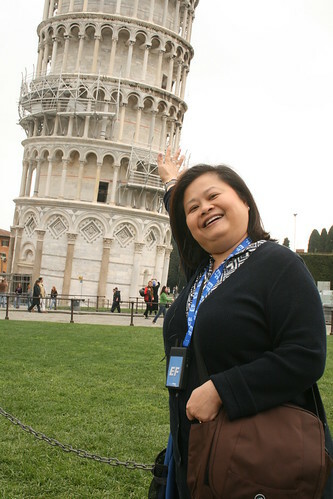 When I was in Italy this Spring, we had the opportunity to add Pisa to our tour as a day trip. I jumped at the chance. 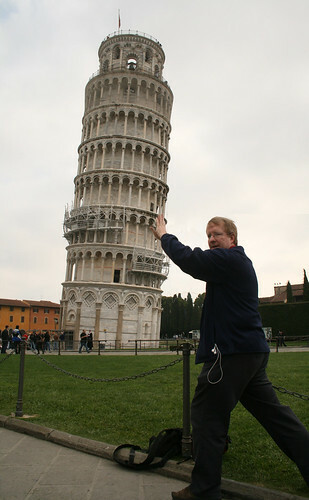 Because if you the chance to pose with the Leaning Tower, you can't pass it up. The tower is just one part of a much larger and very beautiful complex. The inside of the adjacent church is just gorgeous, but it's the tower people come to see. And be seen with. My wife being a good sport. 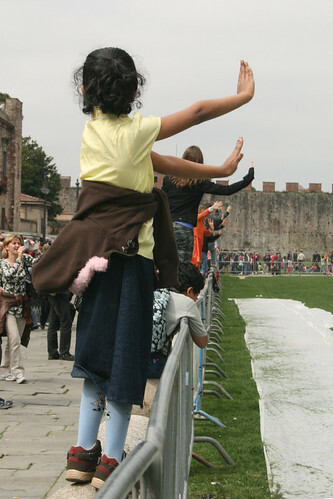 They had a fence around the lawn, so lots of people stood on the stone posts to get the right perspective. And it's hard to get the angle just right. And if you didn't know what this guy was doing, he'd look mighty foolish. Well, he does anyway. 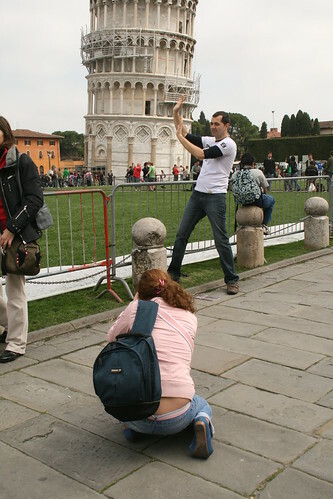 And at any given moment there are dozens of people all lined up taking the exact same picture. 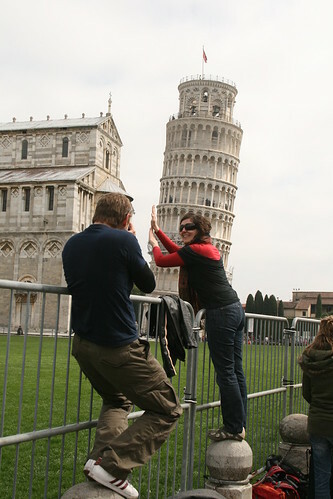 When I posted my pictures to Flickr (and here is the full set), someone noticed my meta-picture and asked me to submit it to the Pisa pushers pool which is all pictures of people posing with the Leaning Tower. For some reason that sort of circular concept just tickles me to no end. BlatantCommentWhoring™: What sort of cliched pose have you taken a picture of?